It’s the end of a long week. My wife and I decide to relax by eating out, and visit a famed joint in South Bengaluru. We are in for a major disappointment as soon as we land at the joint. There is a long serpentine queue and the waiters are ushering in hungry customers into the waiting room after making them wait for a period of one hour. The crowd at the joint is swelling by the minute and the support staff is really irascible now. This is the scene at most of the old joints in Bengaluru that are interested in cashing in on their Brand Value. However, Customer Relationship Management (CRM) is not on their radar. We look at each other and decide that enough is enough. We quickly retreat from the joint before being hastened into the waiting room. We head to VV Puram, eat street food and get back home. VV Puram is probably one of the most organised street food places to enjoy a variety of delicacies. The same however, cannot be said about other food carts or food streets across the city. Hygiene is a serious issue at these joints. There is no proper regulatory mechanism in place to check whether the food served at road side stalls is made using the right ingredients. The complete lack of hygiene at these joints. Most of the kitchens at these makeshift joints are squalid and not cleaned regularly. The huge amounts of garbage generated by food carts, and lack of segregation at source is also a cause of concern. The food carts and street vendors are not regulated by the BBMP/ FSSAI to ensure that ingredients used conform to a basic standard. Is banning street food and evicting street food vendors from the places they have occupied a solution? No definitely not, everyone has a right to livelihood. However, in one’s attempt to earn a livelihood, one should not inconvenience the public at large. Pedestrians are the worst-affected in Bengaluru because of the fact that most pavements are occupied by the ubiquitous Kebab, Biryani and Dosa stalls. A consensual approach is needed to rehabilitate these street food vendors. Most Indian cities face the same challenges that Bengaluru does in terms of rehabilitating street food vendors. European nations are known for their street food delicacies. However, it is regulated well enough, which ensures that a basic level of standard and hygiene is maintained. There are designated spots where one can enjoy a Spaetzle in Munich or a Trapizzino in Rome. A very totalitarian view of this entire matter would advocate banning of street food in Bengaluru. However, a case study from Rajarajeshwari Nagar shows how there could well be a successful middle path. A food technologist, who worked with Kraft Cadbury for a very long time, and thereafter with Kelloggs, has rehabilitated street food vendors and made them a part of his business venture. 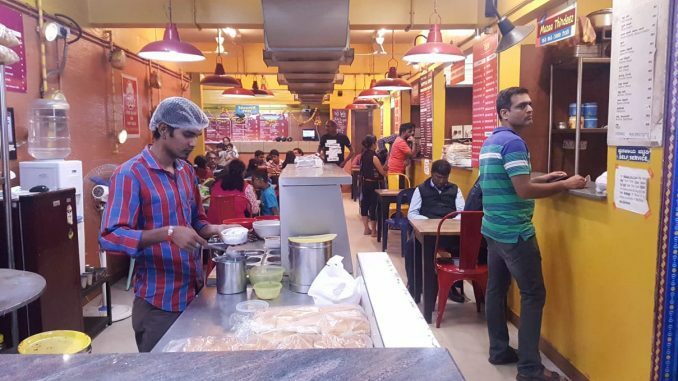 Balaji Hiremagalur, runs a unique venture, J&J’s Captain Cook Food Court that stands on Jawaharlal Nehru Road, opposite BEML Complex and Ambedkar Park in Rajarajeshwari Nagar. Balaji’s journey started in August 2013, when he decided that food facilitation would be the business model. He initially thought of selling only sandwiches; however he dropped that idea after a little bit of research revealed that sandwiches were not exactly the best way to go forward. This is when he decided to go ahead with the concept of a stand-alone food court, outside a mall. He was also very clear on having specialists for the job and a place, where one could sit and enjoy a variety of cuisines. The first vendor that he found for his restaurant was a man from Jharkhand who made his living by selling food on the street. Similarly, he found other street food vendors for South Indian, Chinese, Continental and Mumbai Cuisine (Pav Bhaji & Chaats). He also found a vendor who sold ice cream and juices on the pavement to sell the same at his joint. Pic: Caption Cook FB page. Balaji and his family also worked on other aspects of the business such as legal approvals, real estate and marketing. Special attention was paid to branding and marketing. They even got the logo and brand name registered with the Registrar of Trademarks. The logo was designed with a lot of attention to detail, with focus on the right color palette, shapes and symmetry. Balaji says that he was appalled to see the way food was being served at most street food joints upon his return to Bengaluru. He feels that there is a need to ensure that food served at any joint including food cart needs to meet certain quality standards. Huge amounts of garbage/ trash are left behind every night by these unregulated street food vendors. It is a monumental task for the BBMP to clean up the trash, more so if these joints are located in residential localities. All this set him thinking. He decided that he needed to work on a business model and do something about rehabilitating street food vendors. “Most Darshinis in Bengaluru serve a wide variety of cuisines and it is quite reasonable. However they are not specialists in any single cuisine and the North Indian/ Chinese food served at these joints is definitely not authentic. I also see a lot of people being forced to stand and eat their meal at most of these Darshinis. We consciously decided to stay away from this model,” says Balaji. Pappu Singh, the vendor who runs the North Indian Chaats counter at this place, came to Bengaluru from Jharkhand in 1994. He worked for a chat centre nearby till 2004. He had his own push cart, till Balaji approached him. Pappu joined Team Captain Cook as a vendor. Now he has no hassles and the profits are much higher. “I just have to focus on the ingredients and ensure that quality is of the required standard. This arrangement is hassle free. My family also moved to Bangalore after I opened the counter at Captain Cook,” he adds. A lot of income does go unaccounted for and causes a lot of loss to the exchequer when an informal sector like street food is not brought within the formal realm. Balaji praises the BBMP and Food Safety and Standards Authority of India (FSSAI). He says he has had no trouble in getting licences and other legalities sorted. Venkat, Balaji’s son is an IT professional and has designed a billing software hosted on a Cloud Platform which is foolproof and transparent for vendors. Venkat also makes a mention of his prepaid card mechanism used at the restaurant. The customer gets a card loaded with money at the cash counter before he proceeds to select and buy his meal. This according to him has ensured a certain level of digitisation as well as minimised revenue losses. The Quality of Food Served at Captain Cook Food Court is pretty good and the customer gets value for his money. The team focuses on customer satisfaction, and every review that they receive is replied to. Balaji plans to replicate the unique revenue sharing model and in the process rehabilitate a few more street food vendors. He is also open to the idea of a franchise model to expand further. The way forward – what can BBMP do? Rehabilitation of street food vendors remains an area of concern for BBMP. There is also the issue of hygiene, garbage and ingredients, the loss of revenue for the state and central government. BBMP and FSSAI (Food Safety and Standards Authority of India) could address issues such as hygiene, garbage and loss of tax revenues if this sector is regulated and formalised. It also provides for better data collection for accounting GDP and job creation. 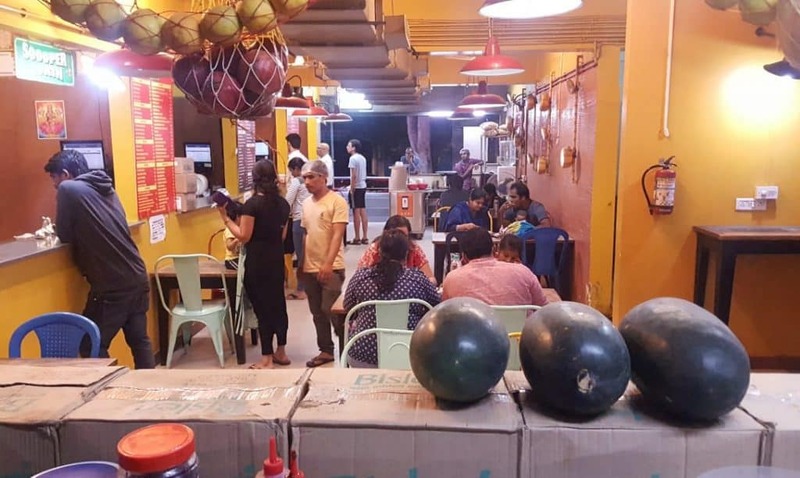 However, at the city level, concerted efforts need to be made by BBMP to ensure that street food is sold at designated spots, the use of ingredients is regulated and more importantly these guys pay their taxes to the government and license fees to the BBMP. The BBMP needs to take a holistic view of the entire matter and initiate steps to formalize the business of street food. The municipality often complains about the lack of revenue. This may not pull them out of the fiscal crisis that they are in, but at the least, it would ensure a flow of income they are currently not tapping into. Kudos to Mr. Balaji Hiremagalur for his efforts towards formalizing the street-food vendors. Both the vendors will make a better living and the pedestrians will enjoy a decent pathway (while denying corrupt officials bribes). God bless Balaji Hiremagalur, and I hope his model spreads thru’out Bangalore. For a starter, why are they called “street” food? This is a very elitist perception that once you shift into a mall, you can blur off the reality of the world outside. Until there is a poor man left to eat and one more left to serve, street food will continue and must. For the rest, for whom food is a matter of choice, yep, a mall is always an option. Totally disagree. Street vendors are a nuisance to the public. Everyone has a right to earn their livelihood. True. But never at the cost of others. Pavements are meant for pedestrians for walking including street vendors and not for street vendors alone. If street vendors are capable of carrying their business by paying bribe to government officials, they can definitely join together and take private vacant properties on lease, erect temporary toilets, washrooms, earmark and share small place of 6X6′ piece of land on sharing basis of 3 shifts and carry out their business. There are hundreds of private lands more than 10000 Square feet and vacant where garbage is dumped by the public and municipal authorities are showing blind municipal authorities are least concerned to remove street vendors because officials and Staff get their hafta regularly at the cost of revenue to the government and inconvenience to the general public.